The Amazon is unlike any place on earth. It is home to an incredible diversity of plant and animal life. Shamans and healers have taken advantage of this diversity to make all sorts of potions, teas, and ointments from indigenous plants. Medical professionals steeped in Western medicine have begun taking a strong interest in Amazonian traditional medicine. Where pharmaceutical drugs have been unsuccessful, traditional medicine might have better luck, or so the reasoning seems to go. But what does scientific research tell us about these plant medicines? Do they actually work when it comes to healing the body? Let’s travel to a rainforest in the Northwest Amazonia, to the countries of Colombia, Ecuador, and Peru. Researchers tested six traditional plants from this large swath of continental South America to find out what made them “tick” when it came to healing people. 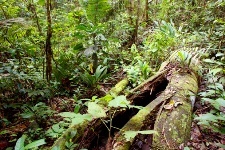 Here are the six plants the research team studied: The bark of B. rosademonte; the leaves and stems of P. glandulosissimum; P. krukoffii; P. putumayoense; S. grandiflorum; and V. baccifera. The primary reasons these plant extracts exert such outstanding protection against cell damage (oxidation) is because they contain not one, but two of the most potent flavonols: catechin and epicatechin. Catechin, in particular, is such a strong antioxidant that it was found to be 12 times more powerful than the next flavonol in line, caffeic acid. These herbs are likely difficult to find, but they should stay on your radar for their potential to prevent some of the major diseases, like cancer and heart disease. Lizacano, L.J., et al., “Lipid oxidation inhibitory effects and phenolic composition of aqueous extracts from medicinal plants of colombian amazonia,” Int J Mol Sci 2012; 13(5): 5,454-67.